L'Officiel France takes its readers on a Moroccan safari adventure with American teen Maggie Jablonski and Norwegian photographer Stian Foss in tow. 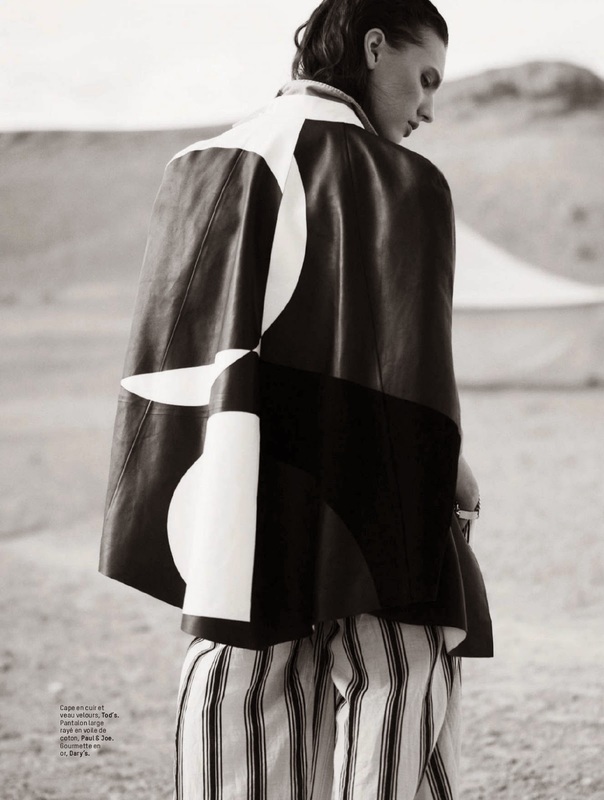 "La Captive du Desert" features the fifteen year old Major Model-repped newcomer on location at the Scarabeo Stone Camp situated in the sprawling desert landscape of Agafay, located 40 kilometres from Marrakech. Jablonski is dressed to brave the elements in khaki, light weight cotton, and heavy duty trench coats styled by Anne Sophie Thomas from the collections of Chloé, Givenchy, Lanvin, Tod's, Paul & Joe, and Bottega Veneta. Jablonski is a picture of calm serenity while nursing a baby goat, pitching her tent, laying by the camp fire, or taking in the magnificent Marrakech sunset. Since her stunning debut at Prada's Spring/Summer 2014 Menswear show, Jablonski has carved up the international runway circuit appearing recently at Chanel, Roberto Cavalli, Dsquared2, Proenza Schouler, and Alexander Wang during the Fall/Winter 2014 collections. Jablonski's star quality is equally incandescent in print with editorial appearances for Document, Jalouse, Odda Magazine, and L'Officiel France, and a Steven Meisel-lensed Prada Spring/Summer 2014 campaign under her lithe belt. Perhaps even more alluring is in spite of her All-American Tennessee roots, Jablonski's bloodlines are predominantly Polish which explains in part her distinctly European chic appeal.